Dr. Philip Keith brings high quality focus to the practice of radiology from his background of providing comprehensive radiology services to critical access hospitals as well as large hospital systems. His skills range from nuclear medicine services to minimally invasive radiologic interventions spanning across specialities including oncology, urology, gastroenterology, orthopedics and primary care. Dr. Keith earned bachelor’s degrees in Biology and History at the University of Cincinnati College of Arts and Sciences. He received his medical degree from the University of Cincinnati College of Medicine and completed internship at the Jewish Hospital of Cincinnati. He completed diagnostic radiology residency at the Medical College of Wisconsin and received additional fellowship training in thoracoabdominal imaging at the University of Virginia. He is a member of the American College of Radiology, American Roentgen Ray Society and Wisconsin Medical Society. 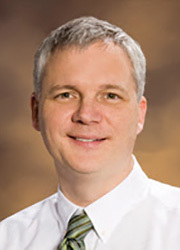 Dr. Keith is board certified by the American Board of Radiology.